Introduction: Are You Serious? It’s Just Coffee, Right? The first time I remember becoming interested in coffee was on a study abroad adventure in the fall of 2001. My new bride, Shayna, and I went to Italy for a few months as she finished up her university studies. I tagged along, studying the culture, the language, and the guitar. We arrived in Rome in early September and spent a couple nights at Casa Olmata, a small hostel a few hundred meters from the Basilica di Santa Maria Maggiore. Our accommodations included a free breakfast at a café across the street from the church, and that first morning, still tired from the journey, we had to hustle down the narrow streets to make it to the café before the day’s breakfast offer expired. A treasure of sights, sounds, and smells greeted us when we stumbled into the small but elegant café, jet-lagged and a bit doe-eyed about being so far from home. We handed the barista our breakfast tickets, and he handed us two croissants and two small ceramic cups full of a mixture of foamy milk and espresso. At the time, I was not much of a coffee drinker, but when in Rome…well, you know. He called it a cappuccino—my first espresso drink ever. It was tasty enough, and when we came back the next day, I was looking forward to my new ritual. That fall, I picked up the habit of drinking espresso after dinner—dark and sweet, just like the Italians. Admittedly, part of the attraction was that I was enamored of Italy’s food and culture and wanted to feel as Italian as a farm kid from Dayton, Washington (population 2,500), could. I didn’t fit in with the locals, but I could at least drink their coffee. Italy shaped my perception about what espresso should be, a perception that would stick with me for nearly a decade. After returning to the United States, I would order espresso after dinner, finding that it wasn’t always easy to get in American restaurants. I did not understand why the espresso habit had not caught on over here. I later found out that it had, but in a very different way. Fast-forward a few years to 2006. I was in Boston, looking for a job. On a coffee run, Shayna saw a sign outside Starbucks saying the company was hiring and suggested I apply. At first, I was skeptical, having never worked in any type of service industry, but the company did offer benefits and I thought it might be interesting. I stopped in one day, filled out an application, and dropped it off with the barista on duty. A month or two later, a manager of a Starbucks close to our apartment called and invited me in for an interview. When I arrived, the manager offered to buy me a drink, and I ordered a double espresso, which created a mini-stir among the baristas behind the counter. “What else would anyone want?” I wondered. Apparently, most people who came in for interviews were looking for something less direct. So were most Starbucks customers, as I found out after I was hired. The best part of my stint at Starbucks was the interaction with my fellow baristas. They were an eclectic group of people who loved to be a little crazy and have fun. Every morning, we would gear up as the morning rush of people started flowing in around seven a.m. For the next couple hours, we were slammed, putting out drinks as quickly as we could, trying to keep up with the line. Some days, chaos reigned, but other days, when the group was in sync, our customers rarely had to wait more than three minutes for their drinks, no matter how many people were in line. My time at Starbucks gave me a new appreciation for coffee. By 2006, Starbucks had gotten rid of all its semiautomatic La Marzocco machines in favor of machines that would grind, tamp, and pull shots at the push of a button, so I did not learn anything about the craft of making espresso, but I did get a basic understanding of how to prepare coffee and steam milk. I also learned a little about the different growing regions and some of the subtleties that were commonly associated with them. At Starbucks, you’re supposed to try every coffee they offer within the first year you work there, so you have to be deliberate about doing tastings. Kurt, one of my coworkers, and I liked to pull out our company-issued coffee passports and fill them out with the various flavors we recognized. At first, they all tasted like coffee to me, but Kurt helped me out, and over time, a few flavors began to distinguish themselves. For additional practice, we regularly pulled out the French press and paired coffees with the pastries and candies in the store (the Arabian Mocha Sanani was dynamite with the chocolate-covered cherries). Occasionally, customers joined us as we tried to pick out the fruity notes of an African coffee or the earthiness of the Sumatra, an earthiness we compared to leaves in the fall. Some people might rail against corporate coffee, but working for Starbucks was a great experience for me. Though I liked working at Starbucks, another adventure abroad taught me it did not necessarily sell the best coffee in the world. In February 2007, I took a trip to Spain, scheduling a seven-hour layover in Milan, Italy, with the hope that I could get out of the airport long enough to see something interesting. It turned out to be one of the best travel decisions I ever made. The plane arrived at Milan’s Malpensa Airport about seven a.m. After speeding through customs (as fast as is possible in Milan at seven a.m.), I walked to the train station and ordered a round-trip ticket to the first town on the line, Saronno. As I looked out the train window, a surge of emotion welled up inside me. The sun was shining brilliantly in the blue sky that morning, and the light reflected off the morning dampness, giving the passing landscape an ethereal brilliance. It seemed like the northern Italian countryside was showing off just for me. When the train stopped at Saronno, I eagerly jumped onto the platform, where a few passengers waited for the next train into Milan. Lacking a map but not initiative, I plunged into the city with enthusiasm. Saronno was just waking up for the day when I arrived. The streets were nearly empty—the bars and cafés along the quiet cobblestone streets had only a few early customers. I wasn’t ready for breakfast yet, so I wandered around for a while. Soon, I found myself at the center of town sitting on a bench in front of the main cathedral. The piazza was nearly empty, but after a while, people trickled in. Old women passed by with their grocery carts, heading off to catch the best selection at the morning market. Groups of teenagers on their way to school lurched and pushed their way by, their shouts echoing across the open space. The bells of the cathedral rang loudly, signaling a new day had begun. Despite being famous for its amaretto liqueurs (something I unfortunately found out well after I left), Saronno seemed like a place that does not get a lot of foreign visitors. There were no groups of German or Japanese tourists being herded through the piazza with their matching hats and cameras, nor did I see many foreign laborers. Saronno was a quiet little town that was content with itself, not looking to grow and not expecting to shrink. More than a few people passed by, staring at the odd foreigner, notebook in hand, trying to capture the moment in words. When the writing inspiration wore off, I decided to seek out two things: a newspaper and a caffè. But where to go? I wandered around some more, seeking out just the right spot. Finally, I chose Caffè del Corso, a bar (in Italy, bars are similar to American cafés, though they usually also serve alcohol) on Corso Italia. When you are in a foreign country, entering a new place for the first time is always the hard part, at least for me. You aren’t 100 percent sure about how things are supposed to work, and no one wants to make a fool of themselves. In a small town like Saronno, the first step is especially unnerving, since everyone else inside already knows each other. The entrance of a stranger precipitates the simultaneous snapping of necks as heads turn to see who the new guy is. At that point, you feel like you are under a microscope, hoping you don’t screw it up. Caffè del Corso was small and stylish, with a long, gracefully curved, high wooden bar and three or four tables, only one of which was taken. Very few Italians sit in cafés like Americans do. They come in, stand at the bar and quickly drink their coffee, then leave. I, on the other hand, wanted to sit down for a while and soak in the atmosphere. Stepping up to the register, I asked the middle-aged man behind it for a giornale (newspaper). He said he didn’t have any and pointed across the street toward a newsstand. I walked over, bought a newspaper, and returned to the bar, ordered a caffè (espresso) and a chocolate brioche (croissant), and sat down at the table farthest from the door. I am sure the setting had something to do with my perceptions, but I recall the espresso was very good and the brioche was fantastic. I couldn’t help but wonder why, if Starbucks was modeled after Milan-area cafés, we didn’t serve coffee or pastries of the same quality I was experiencing at that moment. As I mulled over that question, I noticed other customers in the café trying not to stare at me. An old woman at the next table, obviously a regular, kept looking over at me and smiling. She asked the baristas behind the bar who I was, but they only shrugged. My Italian was not great, but it was good enough to get the gist of what was being said. Finally, I got up the nerve to talk to the baristas, asking clumsily if I could take a picture. Once I asked, the old woman realized I spoke some Italian, and she began gesturing and saying all kinds of things to me. The thing I love about Italy is that if you speak even a little bit of the language, the locals embrace you. My new acquaintances were more than happy to chat with me for a while. Bianca and Isabella tended the coffee bar while Alessandro was preparing sandwiches and other small dishes that would be eaten later that day. The tomatoes he was cutting looked delicious. Everything was made fresh each day, with an emphasis on quality. I told them about my adventure, why I was in Saronno, and where I was going. The trio posed proudly as I snapped their picture for a memento. I promised to send them a postcard from Spain, and I bid them farewell. I would have liked to stay there the whole day, taking in the ambiance and working on the language, but it was time to get back to the train station. Immersing myself in coffeehouse culture would have to wait. Back in Boston, I tried to employ the same friendliness with my customers that the Italians had shown me. After fifteen months at Starbucks, I felt like a pretty decent barista. If nothing else, I was good at getting the customers what they wanted and doing it quickly (knowing what they were going to order so I could have their drinks ready sooner was the key). Had we stayed in Boston, I might still be working at Starbucks, hopefully managing a café somewhere by now. However, we decided to move back to Washington following the birth of our daughter in 2007. I left Starbucks with much sadness and moved home to a town that was noticeably underserved when it came to quality coffee. The first time I tried a true Portland coffee, I was less than impressed. I can remember the day clearly. It was March 16, 2008. We had come to Portland so Shayna could run the Shamrock Run with a friend, Katie. After the race, Katie led us to her favorite café downtown, Stumptown on Southwest 3rd Avenue. I hadn’t had good coffee for a while, so I was looking forward to some espresso. I didn’t know (or care, to be honest) what Stumptown was. I ordered an espresso and sat down. As usual, I stirred a packet of sugar into the cup and took a sip. My face must have contorted itself because my wife and her friend both laughed at me. The flavors were not what I had expected to taste in an espresso. The shot was tangy and juicy, a far cry from the espressos I had previously encountered. “What is that, fruit juice?” I asked, grimacing. “It’s Hair Bender,” Katie replied. Apparently, Hair Bender was her favorite coffee. She had raved about it to us while we were still living in Boston. That morning, I received my first indication that there was something unique about Portland’s coffee culture. Accustomed to a completely different style, I was not immediately taken. However, I did not give up on Portland coffee, or Hair Bender, the espresso blend that revolutionized coffee in the Pacific Northwest. We did not stay in Dayton for very long. Small-town life turned out to be a little too quiet, and soon we packed our bags for Portland, where I would enter the Master of International Management program at Portland State University. In terms of coffee, my life would never be the same. When we pulled into town, we did not know that we were in a hotbed of high-end coffee. I was still fairly loyal to Starbucks, having many good memories of my time in Boston. I did not understand how different the two cities’ coffee cultures actually were. I would find out once I started writing about Portland coffee. In late July 2010, a few months after graduation, I went to Beijing for a month to study the language and culture of a fascinating, rapidly changing China. From my first night in the country, when I stayed in the basement of a cheap hostel, hunkering down in a damp, windowless room resembling a prison cell, to the last day, when I stepped into the vast, airy expanse of Beijing Capital International Airport’s Terminal 3, my life was a blur of activity. Between studying for class and spending time with new friends, every day brought something new to see or do. We traveled to the wide-open prairies of Inner Mongolia, danced on the streets in Beijing’s old neighborhoods, and wandered through parts of the city where tourists never set foot. I didn’t sleep much the whole month, fortifying myself each morning before class with paper cups of bad instant coffee. To keep my friends and family up to date on what I was doing and give them a feel for China, I wrote a blog about my experiences. Unexpectedly, I discovered I liked to write and tell stories. When I returned to Portland, I pledged to keep writing, but I needed a new topic. Coffee was one of the first subjects to come to mind. As a grad student at Portland State, I had become a regular at Park Avenue Cafe, a spacious café on the Park Blocks just a two-minute walk from my apartment. I spent hours there studying with friends or reading through business cases on quiet afternoons. When I went to China, my coffee routine went with me. Thousands of miles from home, cafés were still my go-to place to recharge and get things done. Whenever I needed to escape the bustle of Beijing, I would duck into a coffee shop with my notebook to write or practice reading Chinese characters. Now back in Portland, writing about Portland coffee and its café culture would allow me to merge my craving for exploration with my affinity for coffee. I renamed the blog Caffeinated PDX and set out exploring. What I found intrigued me. Coffee is one of those topics that the more you learn, the less it seems you know. Coffee is a plant, a seed, a beverage, a drug, a livelihood, and an industry. Coffee is everywhere. According to the National Coffee Association, Americans alone drink around 350 billion cups each year. It has been used as a political statement, as a justification for slavery, as a fuel for troops in faraway wars. Over coffee, intellectuals discuss philosophy, famous authors gather to write, and revolutionaries plot rebellions. You can talk about the agronomy of coffee, the economics of coffee, the culture of coffee—pick your area and there is plenty to discuss. The area I chose to write about is specialty coffee. Specialty coffee and its subbranch, third-wave coffee—a small but rapidly growing part of the coffee industry—are full of passionate coffee enthusiasts insistent on improving how coffee is grown, processed, traded, roasted, and consumed. In every major city across the United States—and many smaller ones too—third-wave coffee is blossoming. Portland is a microcosm of the movement, and through the stories of the coffee people in Portland, I hope you gain a better understanding of what makes specialty coffee special, not just in Portland but also around the world. As you read the book, you might notice that sometimes people talk about specialty coffee, and other times they speak of third wave. In most cases, I let the interviewee decide what to call the industry he or she works in. Although people often use them interchangeably, there is a slight distinction between the two terms. The term specialty coffee was coined in the 1970s by Erna Knutsen, a well-known coffee importer in San Francisco, to differentiate the high quality beans she was selling to roasters from the commodity-grade beans her competitors sold. The Specialty Coffee Association of America (SCAA) defines specialty coffees as those receiving a cupping score of 80 or higher (see “Cupping for the People at Portland Roasting” on page TK to learn more about cupping). Today, it generally refers to coffee that is of higher quality than the mass-market, preground coffees available at the supermarket. Third-wave coffee is a subset of specialty coffee that is even more focused on ensuring quality throughout the entire coffee supply chain, from origin to cup. Company size does not necessarily separate the groups—what matters is the attention to detail and an insistence on doing the best job to purchase, roast, and present the coffees to the customer as possible. The chapter “The Waves of Coffee History” goes into much more detail about the third wave. Portland is known more for its quality of life than for its ambition, but despite the sleepy image, Portland is at the forefront of the third-wave coffee movement. The coffee scene in Portland is very much an extension of the do-it-yourself, geek-out culture that the city is known for. Portlanders like to be nerdy about food, wine, beer, whiskey, and coffee. Their love for coffee runs deep, whether you are talking about the hundred-plus-year-old coffee tradition of the Boyd family or the uncompromising quality of Coava Coffee, which opened its first café in 2009. In 2013, Portland was home to nearly fifty coffee roasters, multiple publications that specialize in coffee, and countless cafés. This book covers a wide variety of topics. It briefly touches on the history of coffee and how the industry got to where it is today. It will help you understand what makes specialty coffee different from coffee that came before it. The book is also about my own relationship to coffee and how I discovered a culture I had no idea even existed. When I started traveling around Portland, poking my nose behind café counters, and asking questions, I delighted in the baristas’ enthusiastic answers, but I secretly wondered if they really took coffee so seriously. I did not understand what made Stumptown different from Starbucks. I had never heard about barista competitions—in fact, I would have laughed at you if you said you knew who last year’s World Barista Champion was. Having since judged multiple barista competitions, I laugh no longer. Coffee captured me with its complexity, community, and worldwide reach. I now understand why people get so excited about it. 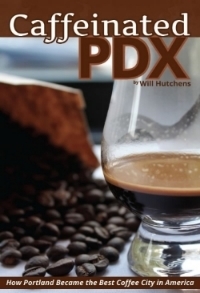 Other cities have important coffee cultures too, and critics might find this book a little too Portland-centric. Guilty as charged. However, there are many lessons that can be learned about what is happening in coffee around the country by taking a look at how Portland’s coffee industry developed. Furthermore, conventional wisdom says you should write about what you know. After spending so much time traipsing around the city talking to coffee people, I have a good understanding of Portland coffee, and that is what I want to share with you. Part memoir, part guidebook, and part historical record, this book attempts to answer the question, are Portlanders really that serious about coffee? The answer, I would find, is an emphatic yes.